Do I need to buy a DVD player with a built-in Dolby Digital/dts 5.1-channel decoder? Which surround sound speakers should I get? Bookshelf or Tower Speakers? Do I still need a subwoofer with the floor standing tower speakers (M60 or M80)? Direct-radiating or quad polar speakers for the extra 2 speakers in a 7.1-channel system? Will the QS8 rear speakers work well for music playback? Which TV display technology is best? LCD or Plasma? 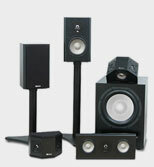 Speaker Delay: How to Set Up Surround Sound Speakers? Stereo Speaker Placement: Where to Put M3 Bookshelf Speakers? Where do I set the crossover control on my subwoofer's back panel? How high up on the walls should I mount surround speakers? Searching for the Best Speaker Sound: What does "speaker accuracy" mean? Why is "delay" important for DVD-Audio or SACD surround music systems? No Surround Effects with Dolby Digital Content? What are "balanced connections" and the benefits of balanced cable? HDTV Resolution and Pixel Count? What does the ".1" stand for in Dolby Digital and dts multichannel surround sound? How much better is 6.1 or 7.1 channels than a standard Dolby Digital 5.1-channel setup? Q. My question may sound stupid, because I'm just a beginner in audio/video. Do I need to buy a DVD player with a built-in Dolby Digital/dts 5.1-channel decoder? And if so, must I also buy an A/V receiver with a built-in Dolby Digital/dts decoder? Or would this be redundant? -- G. F.
A. There is no such thing as a stupid question when you're trying to 'decode' audio! No, you don't need a DVD player with a built-in Dolby Digital/dts decoder because virtually all modern A/V surround sound receivers already have internal Dolby Digital/dts decoders. The DVD player just needs to pass the Dolby Digital or dts data stream to the receiver via a coaxial or digital optical cable, and even the least expensive DVD players will do that. So it would be redundant to get a DVD player with built-in decoders (there is an exception: see below). DVD players with built-in decoders are for use with older equipment that won’t decode the digital 5.1-channel surround formats. For example, you might have a couple of old stereo amplifiers (or an old Dolby Pro Logic receiver) you wanted to use in an inexpensive Dolby Digital 5.1-channel home theater setup. As long as your old amps or receiver have line-level inputs for each amplifier channel, you could cobble together enough amps to feed the front left and right, center, and two surround channels. The DVD player with the built-in decoder will have six analog output jacks, one for each channel. Then you’d need to add a powered subwoofer for the ".1" low-frequency effects channel. You’d use the DVD player’s internal menu to do the proper setup for your speakers. It would be inconvenient adjusting overall volume levels, but it would work, and you’d save the cost of a new Dolby Digital/dts A/V receiver. But if you want playback of DVD-Audio or SACD multichannel audio discs, the DVD player must have a built-in decoder for these formats because there are no receivers that will decode them (the record labels fear digital piracy so they won’t provide digital outputs). Such DVD players almost always include Dolby Digital/dts decoders as well. Q. 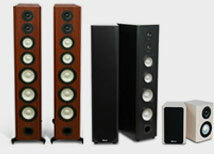 When you allude to the "accuracy" of Axiom speakers, what exactly do you mean? I’ve looked around for a good definition of accuracy but there seem to be many. What is the definition you are using? -- Mike B.
measurement perspective this generally translates into a "linear" response. 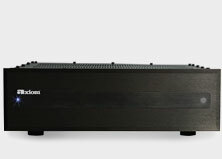 The speaker should evenly reproduce deep bass, upper bass, midrange sounds (including male and female vocals) and treble high-frequency sounds, neither exaggerating nor suppressing any segment of the tonal range. If you drew a graph of a speaker’s response to every sound audible to the human ear, it would ideally be a straight horizontal line (hence the term "linear"). We actually calculate the way an Axiom speaker responds to sound by putting it inside an anechoic chamber (a room with no echoes), feeding it tones representing every frequency audible to humans--from the deepest bass at 20 Hz to the highest frequencies at 20,000 Hz--and then measure the speaker’s output with a microphone, graphing the results on a chart. An accurate or linear speaker’s output should approximate a smooth horizontal line, free of peaks or valleys in response. This would represent accurate reproduction of every frequency audible to the human ear and would be the speaker’s "frequency-response curve." causes them to change, the real designing comes in understanding the relationship of the entire "family" of curves and their eventual overall effect on the listening performance. Q. I have an older stereo system with bookshelf speakers. How do I upgrade this system to a home theater? What should I add next? -- A.C.
A. Besides getting an A/V surround receiver with Dolby Digital/dts 5.1-channel decoding, you could start by getting a center-channel speaker and two surrounds, using your existing bookshelf speakers as the main front channels. Although you may have some tonal differences between the center and your older bookshelf speakers, you would still be able to enjoy full 5-channel home theater, albeit without the deep bass impact that a subwoofer would bring with the ".1" channel. Depending on your budget, I would next add that all-important subwoofer, because part of the thrill of current DVD soundtracks are the deep bass music and sound effects. Assuming you’ve budgeted for the DVD player and A/V receiver, another approach would be to retire your existing bookshelf speakers to the role of surround speakers, and, depending on the room size, replace the front left and right speakers with modern floor standing or bookshelf speakers. You needn’t get a center channel immediately (although I consider it fairly essential) because the movie dialogue will be roughly centered between the main speakers so long as you don’t sit too far to one side. Later on, add the center channel, the subwoofer, and, if you want a more enveloping sound field, a pair of bipole/dipole multi-radiating surrounds. It’s a kind of precedence effect that’s important in real life because it helps protect and alert us to nearby events that might be threatening. (If a car horn beeps to your right as you step off a curb, you immediately glance there and take steps to avoid being run over.) But with multi-channel surround sound, the illusion only works if the sounds from nearby surround speakers reach your ears after the sound from the main front speakers. A. The loosely agreed-upon standard for measuring the power handling of a loudspeaker is five hours of modified pink noise without damage to the speaker.The basic problem with this test is it does not address the dynamic nature of music and movies. The instantaneous peaks of the dynamics are really what is going to determine when you run out of amplifier power and where the speaker will hit its limits. At Axiom, we conduct both tests using pink noise as well as dynamic tests to create the maximum amplifier power rating for each Axiom speaker. In the case of the M80s, they have been tested a minimum of five hours using modified pink noise at 400 watts rms from the amplifier. Furthermore, they have been tested at this level for 100 hours using highly dynamic source material. We keep the ratings conservative, i.e. the tests are actually done at 600 watts for a 400-watt maximum power rating. In fact, the M80s have been tested up to 1200 watts without any problems. You should also scrutinize the "sensitivity" rating of a speaker because this is a standard adhered to by most manufacturers. It tells you how loud a speaker can play for a given input signal level. The sensitivity rating is the sound pressure level (SPL) measured in decibels (dB), produced by the speaker at a distance of 1 meter, with 1 watt of input power. The M80 will produce 95 dB SPL (in room) and 91 dB SPL (anechoic) at 1 meter with 1 watt of input power. That is very loud sound, and because the M80 is this efficient, it can be driven to reasonable listening levels by a 10-watt amplifier. As speaker sensitivity goes, the M80s are at the high end of the scale. However, keep in mind that all of these SPL ratings are done at 1 meter and as you move farther away from the speaker, substantially more power will be required to achieve the 95-dB rating. In very large rooms, a lot of quality amplifer power is required just to achieve reasonable volume levels. More compact speakers like the M2i produce 91 dB SPL (in room) and 87 dB (anechoic) with 1 watt of amplifier power, so they actually need more, not less, amplifier power to produce comparable sound levels. It is important to be aware that loudspeaker acoustic output in decibels does not double each time you double the rms amplifier power. For instance, if a speaker requires 10 watts to produce a comfortable listening level from 12 feet away, doubling the amplifier power to 20 watts would only raise the speaker's sound level by 3 dB. Subjectively, 3 dB sounds "somewhat louder," but it's nowhere near "twice as loud." To achieve that would require ten times as much amplifier power, or 100 watts! So the old adage of buying as much power as you can reasonably afford still applies. We will be covering a lot more detail on all these relationships in the upcoming newsletters. Q. What should the distance be between the two front speakers in a stereo or home theater system, as well as between the two surround speakers? I also want to know at what height I should mount my surrounds? Thanks. -- Adi N.
A. Start by separating your front left and right speakers by about half the distance that you sit from the speakers. If you sit 12 feet back, separate the front left and right speakers by about 6 feet. You can vary this formula quite a bit. At 12 feet, I'd try anything between 5 and 8 feet. Use enough separation between the two speakers so you can easily perceive the stereo effect and directional cues without getting the sense that the sound is emanating from two separate boxes at the front of the room. You want a smooth, seamless, stereo soundstage. There are no cast-in-stone rules about speaker placement other than avoiding corners (except for a subwoofer). Experimentation is the key. You can see some suggestions in our Audio/Video Tips section. As for surround speakers, just remember the way surrounds are positioned in any Dolby Digital cinema--on the side walls, to each side of the listening area, approximately opposite each other and well above the level of your ears. Dolby Labs says that you can also move them slightly to the rear (up to 20 degrees) or a bit forward of an imaginary line drawn across the listening area. Axiom's multidirectional QS8 or QS4 surrounds are very flexible in this regard, and needn't be at the same height or distance from the listeners. Q. I keep seeing criticisms on audio forums of the new DVD-Audio and SACD high-resolution audio formats that suggest that "they have no bass management or delay." I know what bass management is, but why is "delay" important for DVD-Audio or SACD surround music systems? -- M.B. A. One of the most acute abilities of human hearing is our knack for instantly sensing the direction and intensity of specific sounds. If we lacked this ability, there wouldn't be much fun in stereo or home theater multi-channel surround sound, and more important, this directional hearing ability plays a huge role in self-preservation. Our precise stereophonic hearing acuity results from near-instantaneous calculations performed by our brain when it measures the difference in timing of sounds that reach one ear and the length of time it takes the same sound to round our head and reach the other ear. Called "inter-aural time differences" (IAT), these immediately tell us which direction a sound comes from. Inter-aural amplitude (loudness) differences combine with the timing differences to give us our finely-tuned multi-directional hearing ability. Q. My room is 19 ft. x 11 ft. x 8 ft. and I sit 8.5 ft. from the speakers. Should I use the QS4's or QS8's for my rears? My left/right separation for the front towers will be 5 or 6 feet. I like the M60's, but should I go for the M22s? Thanks. -- Phil L.
A. Given the size of your room and listening distance, you could certainly use the Epic Grand Master system, which uses the QS8 surrounds. The latter are a slightly smoother tonal match to the M22ti's or the M60s. 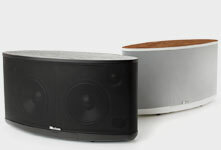 By the way, the QS surrounds should go to each side of the listening area, per Dolby Lab specs, not the "rear". You can use them at the rear if you wish--they're very accommodating--but the side walls are preferred for a correct Dolby installation because that's how 5.1-channel movies are mixed, with the surrounds on the side walls of the listening area. See the diagram below for best placement. If you add the extra single speaker for a 6.1 setup, or additional two rear speakers for 7.1, the rear wall is the intended location. The M60s have a somewhat "bigger" sound than the M22s and of course are capable of significantly deeper bass extension and output as well as higher, cleaner volume levels than the M22ti's. I use the M22s (with a sub) in a slightly larger room and they play as loud as I ever want. However, some of my younger friends and colleagues listen at levels I wouldn't dream of using! So think about whether you want to "crank" the system up with high-level rock 'n' roll. The tonal balance of each model is very similar, with identical midrange and upper-octave detail and clarity. The QS4s are very good, but have slightly smaller woofers, so they won't play quite as cleanly at loud levels as the QS8s. The QS4s are more suitable for modest-sized rooms and lower power-output receivers. A The general guidelines for speaker placement apply to the M3ti's as they would to any compact loudspeaker: Keep them away from corners (which will unnaturally boost the bass output) and separate them by about half your listening distance. You want to achieve a smooth, continuous soundstage across the front with no "hole-in -the-middle" effect. The latter is a symptom of too wide separation between the two speakers. If you sit, say, 12 feet away, use about 6 ft. or more of separation between the two speakers. You can try angling them slightly in towards you (toe-in) or not. Keep them out from the wall by at least a couple of inches, and feel free to experiment moving them farther away from the wall behind. Every room is different, and nearby boundaries may or may not interfere. Most bookshelf speakers sound their best when the top of the speaker is close to your ear level when seated. Usually stands of about 16 to 24 inches are about right. More open, spacious sound is sometimes achieved keeping the speakers several feet away from the wall behind and side walls. Q. I own a set of M80ti's and have had no problems with placement. Why is it I see some people on the message boards (most don't even own M80's) say that these speakers are so hard to place? When asked "Where did you hear this," they say that Alan has said so. If this is true, why would they be any harder to place than any of the other speakers that Axiom offers? A. I'm delighted you've had no placement problems. Readers sometimes repeat what I've said without mentioning the context in which I made the remarks. The room's dimensions and furnishings are always influential, as well as how far back you sit from the M80s. In an average room like mine (19 x 14 x 9 ft.), jammed with other speakers and equipment, where I sit no more than 10 feet back, you can't just plunk M80ti's down and expect to get a perfect soundstage. You have to experiment, moving them away from corners, out from the wall behind them and adjusting toe-in. In my setup, I eventually got my M80s to sound excellent by putting them to either side of the large-screen TV, which is diagonally arranged across one corner of the room. The M80s are only 6 inches out from the wall behind (not as far as I'd like) but I seemed to have found a location where there are no significant interactions with standing waves in the room. I've been nudging the M80s into different locations in my room for a while now, and it's reassuring to discover that it is possible to get M80ti tower speakers sounding good in a smallish room. Q. I have a Dolby Digital/dts A/V receiver but I don't hear any surround effects when I receive High-Definition TV programs from my satellite tuner. And when I play DVDs, I also feel there should be better surround effects. I thought "Dolby Digital" is supposed to be a big improvement. What gives? – R.H.
A. There are two issues here. In your case, you are assuming that every HD satellite broadcast will be in Dolby Digital 5.1-channel surround, and that is not always the case. It's true that "Dolby Digital" (DD) is the audio standard that's specified for HDTV, but broadcasters may choose from several Dolby Digital flavors: Just because it says "Dolby Digital" does not mean that a soundtrack is broadcast in 5.1 channels. There is also Dolby Digital 2.0, which means you will get digital sound but only in 2-channel stereo. Plenty of older movies or programs that were mixed in 2-channel stereo may be broadcast on HD channels in Dolby Digital 2.0. If your A/V receiver is properly configured, it will indicate that and let you switch to Dolby Digital/Dolby Pro LogicII, which will simulate a 5.1-channel surround format from the DD 2.0 soundtrack. Note that if the DD signal the receiver detects is Dolby Digital 2.0, the receiver may automatically default to "Dolby Digital + Dolby Pro LogicII" without your having to select it (my H/K A/V receiver does that automatically). If you press the Dolby Digital button on the remote, you can switch to DD 2.0 if you want, but you lose the surround channels and the center. I ran a cursory check of HD broadcast channels I receive from Time-Warner's Digital Cable service and some were in DD5.1, others in DD2.0. Surprisingly, most of the High DefinitionTV sports broadcasts of basketball and football games are in Dolby Digital 5.1, even repeat HD broadcasts of recent games on InHD. Most DiscoveryHD programs are also in DD 5.1. An older movie on Showcase HD was in DD2.0, but some current drama series ("Charmed") was in DD5.1, as was a movie on HBO-HD. If the HD broadcast truly has a DD 5.1-channel digital soundtrack, your receiver will detect a digital "flag" in the data stream and automatically switch to the Dolby Digital 5.1 mode. Your front-panel receiver readout or on-screen menu will say that and it will not let you change the surround format. (This assumes you are using an optical or coaxial digital audio connection from your HD tuner or your DVD player to your receiver. If you use only an analog stereo connection, the A/V receiver will replay the soundtrack in Dolby Pro LogicII or dts Neo6, or Logic7 if you prefer.) Be sure you select the correct digital audio input (optical or coaxial) for whichever source you are watching. Note also that dts is not part of the HD broadcast standard; you will get dts only from DVDs and dedicated dts multichannel discs, not from digital TV broadcasts. And dts is an optional soundtrack format; it is not a requirement on a DVD. When you play a DVD, go to the DVD menu for your player, and click on Audio Setup or soundtrack preferences (sometimes you may have to click on "Languages" to get to the audio setup). You will have a choice of selecting Dolby Digital stereo or DD5.1, and in some cases, dts. Most DVD players will default to the stereo mode unless you select "Dolby Surround" or Dolby Digital 5.1. Now you can get ready to actually hear surround effects!– A.L. Q. Some expensive A/V preamp-processors and power amplifiers offer "balanced connections." And the new Axiom EP600 and EP500 subs also have them. What are they, and are "unbalanced" connections inferior to balanced? What would I gain in performance using balanced connectors? – J.C.
Used almost universally in the world of recording studios and professional broadcasters, balanced connectors use a three-wire cable fitted with very secure and solid "XLR" connectors (sometimes called "Cannon" connectors). The three-wire balanced configuration is composed of an outer shield surrounding two out-of-phase inner wires that carry the positive and negative portions of the signal. This enables running very long cables--hundreds of feet if necessary-- between amplifiers and preamps or between microphones and a mixing console without picking up hum or interference and without significant signal loss. Since long cable runs aren't required by most consumer audio/video installations, the simpler 2-wire "unbalanced" design and connectors are used—an outer shield that carries the ground (negative) portion of the signal plus a single inner positive ("hot") wire. This design is much less costly and, so long as cable runs remain relatively short, offers ample shielding and resistance to interference and signal loss. From a performance standpoint, an unbalanced amplifier or receiver is capable of excellent performance but may be more vulnerable to RF (radio frequency) interference as well as AC hum problems from "ground loops" and component interconnection. To the electronics engineer, a "balanced" system of inter-component connection is a technically more elegant design but considerably more expensive. – A.L. Q. Should I turn my A/V receiver off, or, like my computer, just leave it on all the time? Does it draw lots of power on startup causing undue strain over time? If I do leave it on, should I turn the volume to zero or is mute ok? Thanks. – I.Z. A. This debate has been going on for years. It grew out of the vacuum-tube era of recording studios and early vacuum-tube computers, where there was good reason to leave tube equipment running all the time. Tube gear takes some time (hours or even days) for the circuits to stabilize whereas solid-state circuitry settles down in a few minutes or less. The surge of power to the tubes' cold heater elements also shortened tube life each time tube gear was turned on. But that just isn't true of solid-state gear used on an occasional basis--even every day--in domestic applications like home theater and music reproduction. The turn-on power surge for solid-state equipment has negligible life-shortening effects, given the remarkable longevity of modern transistorized components. Unless you are running a recording studio 24 hours a day, it makes no sense to leave your A/V receiver on all the time. Heat is the enemy of all circuitry over the long term, and all components generate heat. This is especially true of A/V receivers, which jam seven amplifiers plus control circuitry onto one chassis. (Incidentally, the position of the volume control or whether the receiver is set to "Mute" is irrelevant.) If you want to see how much power you are wasting in heat when you leave the receiver on all the time, look up the "idling power consumption" in the specifications section of your receiver owner's manual. It will likely be at least 120 watts if it's a 5.1-channel (or more) surround-sound model. That's like leaving a 120-watt light bulb running all the time. And most A/V receivers nowadays have "Standby" circuits that use a tiny bit of power to keep the infrared remote receptor and circuit active, so you can use the remote control to conveniently switch the unit on or off. In the days of abundant cheap electrical power 30 years ago, many TV sets had an "Instant On" feature (my old Sony Trinitron had it) that kept a low voltage supply to the picture tube's heater element so the TV didn't have to "warm up" for a couple of minutes. But most brands eventually dropped that feature as the cost of electrical power moved upwards.— A.L . A . The 720p and 1080i figures refer to the number of horizontal lines stacked vertically from top to bottom of the screen. Those are also called "vertical resolution." The 1280 and 1920 figures (called "horizontal resolution") are the total number of individual pixels (picture elements) across each of the horizontal lines for the 720p and 1080i formats, respectively. So it's true that in your example you won't get all 1920 pixels of HDNet's horizontal resolution from your Samsung's 1280 x 720p display. The Samsung DLP, a plasma, or an LCD panel are all "fixed-pixel arrays," and the Samsung's micro-mirror DLP chip has a native resolution of 1280 x 720p. Likewise, a plasma or LCD flat-panel will have a fixed number of pixels across each of its horizontal lines which may or may not exactly correspond with the transmission standard, just as the 1920 pixels that HDNet uses aren't an exact fit for the 1280 pixels of the Samsung DLP chip. But that doesn't matter because the Samsung or plasma set's internal digital scaler will automatically convert all incoming video to "fit" its native resolution. And in my experience the differences, if at all visible, are very tiny. The really visible differences occur between 480p and 720p, or between 480i and 1080i, the differences between Standard Definition and High Definition. Moreover, the overall clarity of a DVD displayed on an HD set is affected by the original movie or program's aspect ratio, which may not be identical to the 16:9 (1:85:1 ) widescreen standard adopted for HD. If you watch some extremely widescreen movies such as "Lawrence of Arabia" (2:35:1), not all the pixels are used by the scanner during the digital transfer to DVD. Consequently, when you watch playback on your HD widescreen set, there will be black bars at the top and bottom of the image, even on a 16 x 9 display. This lessens overall resolution, because all the pixels used to display the black bars are not used for image display. Fewer pixels used for picture content equals lessened resolution. It's visible, but in my opinion it's not a big deal. What does the "Phase" switch on my subwoofer do? Do I set it to 0 or 180? It synchronizes the in-and-out movement of your sub's woofer with the woofers in the rest of your system so that when the subwoofer cone is "pushing" air out, the other woofer diaphragms are also moving outward. If your subwoofer is on the same plane as your front speakers then set the subwoofer phase switch to 0. If your subwoofer is located anywhere else then try the phase switch in both positions and set it to the position that produces the strongest bass at your listening position. Given the vagaries of bass standing waves that result in all rooms, you may notice no difference at all, in which case set the switch to 0. 2. What does the ".1" stand for in Dolby Digital and dts multichannel surround sound? The ".1" channel -- and it is a separate, discreet sixth channel -- handles only the lowest frequencies present in movie soundtracks or multichannel music recordings. Technically, it's "bandwidth-limited," which means it carries bass frequencies of 100 Hz and lower, hence the ".1" designation. The remaining five channels of Dolby Digital or dts are full-bandwidth channels, carrying the full frequency range from 20 Hz to 20 kHz if no subwoofer is used. When you set the speaker designations in your A/V receiver's setup menu to "Small," the receiver's bass management system (a crossover) routes the frequencies below 100 Hz to the subwoofer (LFE) output jack. Most receivers let you choose the crossover frequency for the deep bass. 3. How do I connect the subwoofer to my A/V receiver? I have one cable. Do I plug it into the subwoofer's left or right input, or both? Use either the left or right line-level RCA jack on the subwoofer. You don't need to connect it to both, because the inputs are "summed" to mono inside the sub. Connect the remaining RCA male plug at the other end of the shielded coaxial cable to the single "Subwoofer Output" jack on your receiver. It might also be labeled "LFE Out" (Low Frequency Effects) or "Sub Out." If I get M60ti or M80ti floorstanding speakers for my left and right front channels in my home theater system, do I still need a subwoofer? If you are using a Dolby Digital/dts A/V surround receiver with its own Subwoofer Output jack, and a single coaxial cable to your sub, then the subwoofer's internal crossover becomes unnecessary and you should turn the control to its highest setting (150 Hz) to effectively remove it from the circuit. Some brands of subwoofers may have a "Bypass" switch, which does the same thing. By doing this, you are avoiding "cascading crossovers," or using two crossovers in a row, which may cause losses or gaps in the bass response. The A/V receiver performs all the "bass management" and routes the appropriate frequencies to your subwoofer from the Sub Output jack, so the sub crossover becomes redundant. If you are using your subwoofer for 2-channel stereo with an older 2-channel receiver or amplifier (non-surround sound), then you'd use the speaker-level input connectors on the subwoofer because in most cases the receiver or amp will not have a dedicated line-level subwoofer output jack. You must then set the subwoofer's own crossover to route the low frequencies to the subwoofer. Try a setting of about 80 Hz to start, depending on how large or small your main speakers are. If they are very tiny satellites, you may want to raise the crossover frequency to 100 Hz. How much better is 6.1 or 7.1 channels than a standard Dolby Digital 5.1-channel setup? Am I losing something by not adding the additional one or two back speakers? The vast majority of movies are mixed for 5.1 channels--left, center, and right front channels with two side surround channels. Some more recent movie releases make use of the "6.1" capability, and more recent A/V receiver processors will extract extra information to feed a pair of extra rear speakers on the back wall even if the movie is just mixed for 5.1 channels. There is no question that 6.1-channel or 7.1 setups improve the sense of surround envelopment and also make for smoother and more convincing directional panning effects for side- and rear-mixed sounds, although the room will also influence the degree of improvement. Coverage of surround effects in larger rooms will definitely benefit from the extra surrounds at the rear, and using multipolar surrounds like the QS8 or QS4s will enhance these effects. Certainly there is no downside to utilizing the extra surround capability if the A/V receiver offers it. If I do add the extra two speakers at the rear for a 7.1-channel system, should I use direct-radiating speakers like the M2i or M3ti or the quad polar QS8s or QS4s? In a general way, it's best to use rear speakers that are identical to the surrounds at the sides, although there is some controversy about this. Using identical surrounds at the sides and rear guarantees the same tonal balance and dispersion traits from all four surround speakers. However, many Axiom system owners report excellent results using QS8 or multidirectional surrounds at the sides and two direct-radiating M2i's at the rear. How high up on the walls should I mount the surround speakers? If you are using multidirectional, quad polar type surround speakers like the QS8s, generally from 12 inches to 5 feet above the level of your ears when you are seated will often produce the best sense of surround envelopment. Multidirectional surrounds like the QS8s or QS4s tend to be very accommodating and "unfussy" as to placement and it isn't even necessary to have them at identical heights or distances. Every room is different, of course, and some experimentation with a couple of stepladders to support the surrounds while you listen is useful. With direct-radiating surrounds, higher is usually better, but keep them at least 3 inches away from the ceiling to avoid boundary effects from the ceiling. I love the sense of surround envelopment that I get from my QS8 multipolar surround speakers with movie soundtracks, but I've read that the new DVD-A and SACD multichannel music formats are mixed using direct-radiating speakers at the rear. Will the QS8s work well for music playback? Most of us do not have room to install two types of surround speakers--multipolar types for movie playback and direct-radiating speakers for surround music playback. A few A/V receivers have outputs for two types of surround speakers to meet this need directly, but experience suggests that for many rooms and setups, a multidirectional-type surround will function admirably for movie surround or music playback. In real life, much of the ambient sound reaching our ears in clubs, auditoriums and concert halls comprises a rich mix of reflected sound, and given that most domestic rooms do not have the dimensions to generate this melange of reflections, a multipolar surround is the preferred choice. This subject remains somewhat controversial. However, if you have the budget and the space, then four or five identical tower speakers in very large rooms would duplicate the conditions under which these recordings are mixed.